Some times being in the educational technology business can be a thankless job. The phone call or the e-mail that is a panicked teacher that sends you sprinting down the hallway. We get to play the hero a lot of times….swooshing in to unmute a computer who’s audio is not working before a presentation or other times more complicated matters arise. Nobody ever complains when the Internet is working, when the e-mail chugs along or every student laptop connects to the wireless Internet flawlessly. So here is my shout out when everything works and everything is amazing (see video). 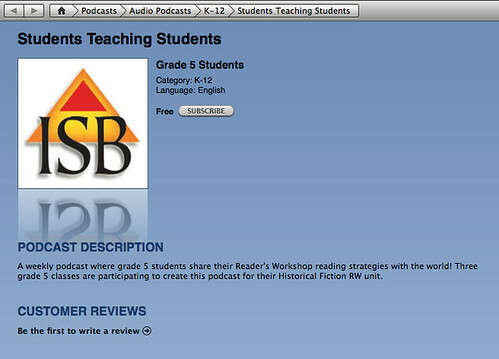 Kim Cofino has been working with three of our 5th grade teachers here at ISB to create podcasts. But not just any podcasts….Students Teaching Students podcast. Chrissy, Robin and Ali have been working with Kim all year on a Reader’s Workshop project. Today I got to listen to one of the podcasts the students made…and I have to tell ya….they are on to something here. If you click on the image to the right you’ll be taken to the iTunes store where you can download the 3 minute or less podcasts the students have started to create…and don’t worry there are more to come. Kim outlines the whole process here in a blog post. This is just one of many projects that Kim has helped teachers with this year. I’m sure many of you reading this blog have either worked with Kim on a project or will in the future. Kim knows how to create a network for learning, she knows how to create projects that span space and time. She uses the technology and her personal network to her advantage. Take the 1001 Flat World Tales Project that she is helping to head up with Jeff Whipple. Organizing some 33 Elementary Schools on 5 continents. I was excited to work with Kim when I moved here this year….only really knowing her through the blogosphere and I have to say she’s helped me learn a ton this year. This is probably the only blog post this year that wasn’t first bounced around in a conversation with her. It’s great to have an equal to help you out with everything. Two full time Ed Tech people for 70 teachers in the Elementary School…I’m not sure ISB knows just how amazing that is…and then to have Kim be one of those two and some other slacker tagging along is just unheard of. It truly is unfair that one school gets that must Ed Tech power. So here’s to you Kim. You are amazing whether people are happy or not! That is such a rare and amazing thing, and I am glad you realize it while it is actually happening. Far too many folks only realize how amazing a situation really is… when it no longer exists. I envy that level of collaboration and collegiality with other folks doing what you do. Oh wait…got one…and a Utecht too! I think the “slacker” comment was referring to me! When I think of organized, I think of Kim!! You,Kim,Chrissy being enabled by Annelies,Struan and Teresa you have one POWERHOUSE elementary school. Not to mention the dynamic Chad/Dennis duo just down the hall. Every school needs a team like that!! keep up the great thinking and posting. Yes, I agree, Greg Israel and I count ourselves lucky that we have two half-time technology integration specialists at KIS were we have 700 computers and 80 teachers between the middle school and high school. It is rare to have that much support; plus, we have Bruce Roadside as a tech coordinator, so really three people. It makes the teachers feel comfortable using the technology, because they know they have support when and where they need it. And I’d just like to remind you all, that you can’t have her – she’s ours – so don’t even think about “pinching” her!! It’s an absolute joy to work with people who inspire and support you. The teachers at ISB are incredibly fortunate to have such a powerful tech team. Teaching and learning is truly affected in a big way as a result of their creativity, support, and forward-thinking. A big thank you to Kim, Jeff, Dennis, and Chad for all you do! We are an amazing team. I truly feel that I’m lucky to be here at this point in time….and with teachers like you willing to push and try something new and take that risk…makes our jobs that much more fun! Keep pushing…that’s what we need! I appreciate you taking the time to recognize the efforts of a colleague. We need to continue to do more of this. No arguments here. Kim has been very helpful to me as well. It certainly also helps to have a Dennis, Chad, and even a Jeff too.